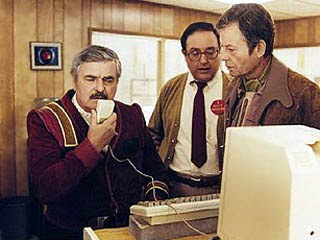 Late in the 20th Century Chief Engineer Montgomery Scott is at the PLEXICORP offices with Dr. McCoy and trying to explain how to construct "transparent aluminum" to Dr. Nichols, the plant manager. Scotty is offered up the use of a Macintosh sitting on a nearby desk in order to demonstrate the design. Scotty speaks out in a loud voice: "Computer…"
The Mac Plus sits there. Bones grabs the mouse and hands it to Scotty. Scotty pulls the mouse up to his face and says "Hello computer?" Dr. Nichols looks concerned and instructs Scotty to "just use the keyboard". Scotty says "The keyboard… how quaint"
A commenter on this blog turned me on to a great article written nearly 19 years ago by Bruce Tognazzini, the founder of the Apple Human Interface Group and a renowned usability expert about using the keyboard vs. using the mouse. While Tog maintains in the article that people in tests are faster with the mouse than the keyboard, most people disagreed at that time with his findings. A lot of time has passed since the article was produced and if anything keyboards have become far more ergonomic and many standard shortcut combinations have had significant time to "bake" and become second nature.